Fresh cranberry beans (or other fresh shelling beans) are wonderful cooked slowly in a bit of liquid with crushed garlic cloves and sage leaves. These are delicious hot, warm or even at room temperature. Leftovers can be cooked with rice and served with a tangy green salad or tossed with a bit of minced red onion and canned tuna. Shell the cranberry beans. Peel and crush the garlic cloves. Heat a medium pot or large saute pan over medium-high heat. Add 1/4 cup olive oil, cranberry beans, garlic, sage leaves, salt and pepper to the pot along with 1/2 cup water. Bring to a simmer, cover, reduce heat to low and cook—stirring every 10 to 15 minutes or so and adding additional water, 2 or 3 tablespoons at a time if the pot seems dry—until beans are tender and flavors are fully blended about 90 minutes. 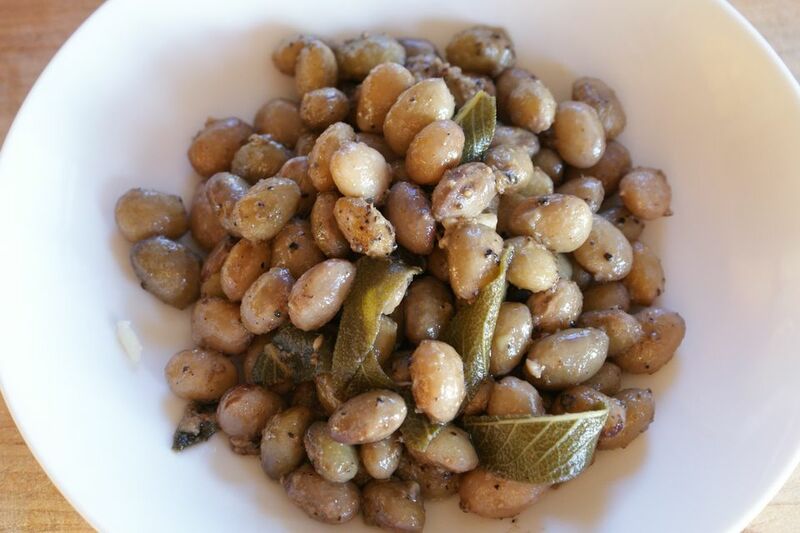 Serve the beans warm or at room temperature, drizzled with fruity extra virgin olive oil.